Hot flashes can strike at any moment.Hot flashes don't care if you are in the middle of a presentation in front of your most important client, if you are sitting in an auditorium full of people at your child's recital, or just doing your weekly grocery shopping. That is what is so frustrating about this particular menopausal side effect, especially when you are still trying to look good. No one wants to walk around looking like a disheveled sweaty mess. So, here are a few tricks and products that will help keep you looking good during your hot flashes. Instead of using your go-to lipsticks, try something new and buy a lipstain. A lipstain is exactly what it sounds like; it will give your lips a smattering of color that will not smudge all day because it is a stain as opposed to a lipstick. These lipstains will stay on even during your most intense hot flashes, and will keep your lips looking fresh and fabulous. Is imperative that you use a sweat-proof moisturizer every morning.You should be using a moisturizing lotion everyday, but if you are hoping to keep your makeup in place after a hot flash, it is imperative that you use a sweat-proof moisturizer every morning. Moisturizer is the foundation that all of your makeup sits on, and if it is able to withstand a hot flash, the rest of your makeup will have a better chance of following suit. You may be someone who has avoided water-proof makeup in the past, but if you want to keep your eyes looking fierce, you should invest in some water-proof eye liner and mascara. Then, when a hot flash hits, your makeup won't end up looking like you just got caught in a rain storm. Be sure to find mascara that isn't extra clumpy, and an eye liner that looks natural. 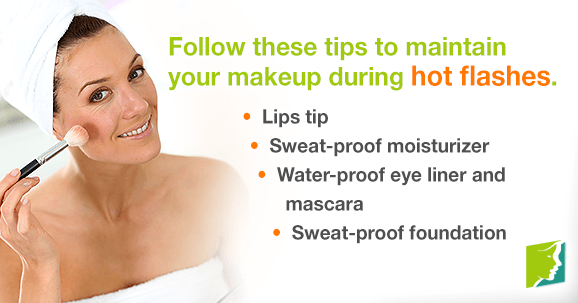 Also, you will need to find a nice eye-makeup remover that is made to take off water-proof products. Find a foundation that will be able to withstand your menopausal hot flashes.Once you have your moisturizer on, it is important to find a foundation that avoid looking like you are melting. Once you find your perfect shade, make sure to apply just enough.Remember: less is more. Knowing what makeup to wear during a hot flash is important, click on the following link for further information towards hot flashes treatments. Miller, Heather and Rose Maria Li, M.D. "Measuring Hot Flashes: Summary of a National Institutes of Health Workshop". Conference report. Mayo Clinic. June 2004: 79.Sikon, Andrea and Holly Thacker M.D. "Treatment for Menopausal Hot Flashes". Cleveland Clinic Journal of Medicine. July 2004: 71 (7). "Hot flashes ... in January". Canadian Medical Association Journal. 2004: 170 (1). Hot flashes are a common symptom of menopause. Click here to learn more.